In this digital age, as processing of images becomes easier, and markets realize that graphic opportunities exist virtually everywhere, the DISPLAY function becomes critical. Visual communication is cost efficient and effective. Stock & Custom Displays, Exhibits, Banner Stands, Signs, Easels, Frames and more. 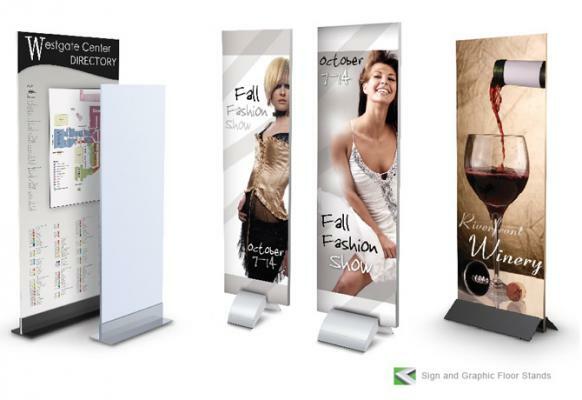 Standing displays suitable for exhibits, trade shows, retail, malls, and restaurants. Graphic opportunities exist virtually everywhere. Features include quality all metal construction as well as convenient easy graphic change-out ability. Made in the U.S.A. quality plus incredible value. Workplace Goods by The Michael Group, Inc. delivers visual communication that's cost efficient and effective.